Wow! It’s our 10th trip of the season already! Canada Day is coming on Friday! And things are really rockin’ up here at The Lodge! 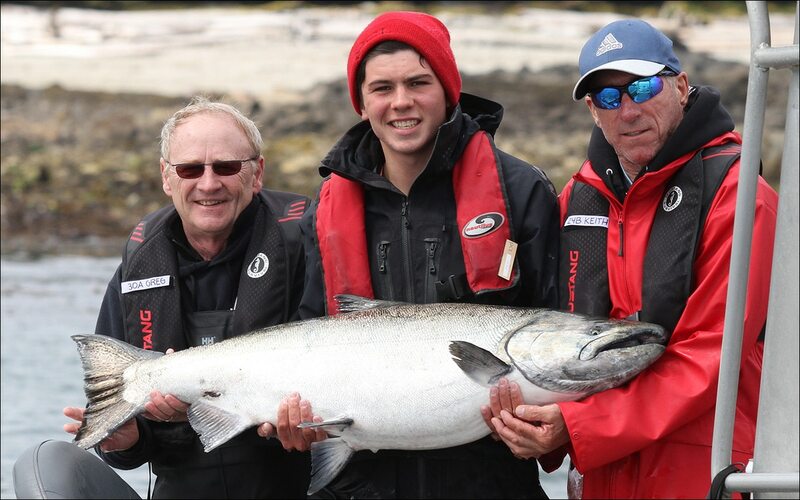 Our Edmonton-Direct guests returned home today with full boxes of fish and hopefully memories full of wonderful moments from their weekend here in Haida Gwaii! We noted a whole new group of fish had arrived in the past few days, distinctly silver, husky fish that tested the mettle of every angler. The average size is getting into the twenties with this crowd and, most excitingly, there are some BIG fish in the mix! Following up on the stunning 42 and 54 pound releases last week, QCL guests found some more where those came from! Recording our largest salmon catch of the 2016 season to date, Greg P hooked and landed a big beauty that taped out to 61 pounds on Sunday! Just setting the gear along the edge of the kelp off Yatze, his guide Isaiah Dahl had not yet placed the rod in the holder when the chrome giant crashed the anchovy and tore off, luckily, away from the kelp! It was Greg’s turn on the rod and he handled it masterfully, bringing fish to boat in good time. When Isaiah finally slipped the net beneath it, the guys gulped a big breath as they finally got a good look. A call out to Shooter for some photos, a quick measurement, and they were able to release the big beauty in perfect shape. Well done fellas! That’s a great fish and thanks for sending her back! Around the same time a similar situation played out just north in the gap between Klashwun Pt. and Shag Rock. With lots of current and unpredictable upwelling this can be a tough place to fish. But it is productive and so discovered Rick S when he hooked into a heavy Chinook that put up a serious battle before finally coming to the net. With no intention of keeping it, Rick and his fishing partners quickly taped the prize out to 39 pounds before reviving and sending it back. Wonderful work guys! Meanwhile over on “the dark side” at Cape Edenshaw, Jay R was doing battle with yet another mighty Chinook from the boat of guide Ryan Winger! The waters off “Piggy Bay” have been particularly productive lately and that’s where “Horseshoe” was working his ‘chovy when the rod lurched beneath the surface and Jay leaped to action. 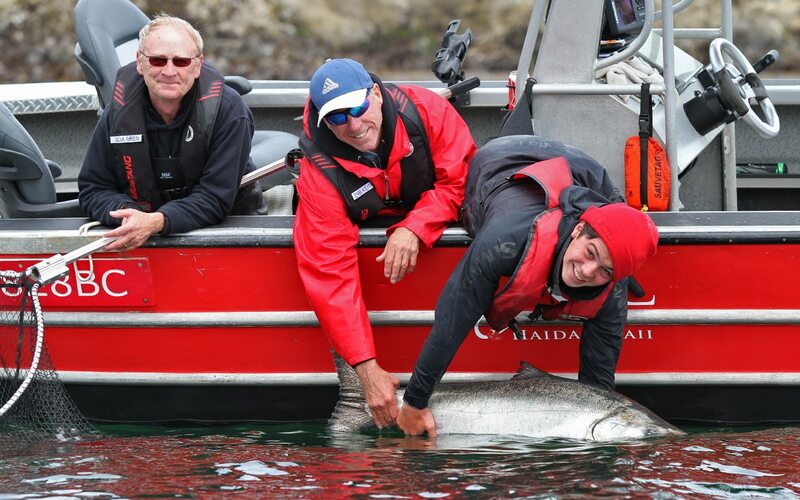 The determined salmon took some serious work to boat but the guys were over the top when they finally had it in the net. Ryan had already started reviving the fish alongside his Grady when they got a call from another, alerting of an approaching sea lion! 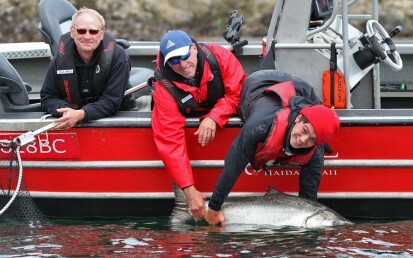 With some quick thinking, they lifted the salmon back into the boat for safety. Ryan jammed the boat into gear and they sped off to elude the hungry mammal. Safe from the sea lion, they resumed the revival until the huge Tyee swam away with strong strokes. Scoring out to 42 pounds, this big Chinook will hopefully find its way back home to keep the strain alive in the future! Fantastic fishing boys! Thanks for going the extra mile!